I've never been anything but proud of my humble origins. Both my parents' families were large, rural and poor -- hardworking small farmers in Central and West Texas. Like so many others during the thirties and forties, they and most of their brothers and sisters made their respective ways to the cities to work for the oil companies and aircraft factories. So the lifestyle began to change, but the cooking didn't. As a baby boomer, I grew up in Fort Worth with a mother that cooked like she was still on the farm. And I'm grateful for the experience. When I was growing up, there were two kinds of bread: cornbread and white bread (referred to by my parents as "light bread"). Light bread was for toast and sandwiches. Corn bread was for meals. There was a hot pan of cornbread on our supper table almost every night. There are three basic cornbread recipes that follow. Each of these recipes can be prepared as muffins, corn sticks or cornbread. You may notice, too, that none of these recipes lists sugar as an ingredient. 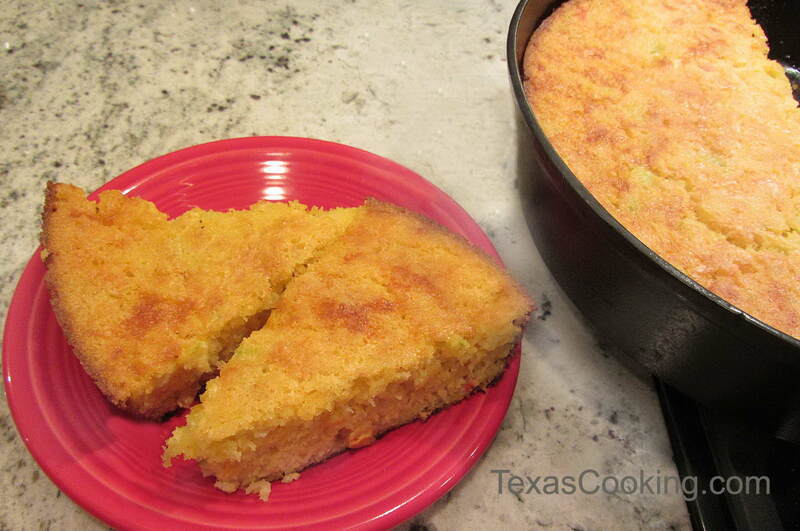 Sweetened cornbread is most often found north of the Mason Dixon line. Sugar just is not traditional to Texas or southern cornbread. My mother made the cornbread she grew up with, what I like to think of as "poor folks" cornbread, i.e., buttermilk Cornbread without flour or sugar. Listed below, it is entitled Grandma's 365-Day Buttermilk Cornbread. Also included are recipes for Buttermilk Cornbread with Flour (for those who prefer the finer texture flour imparts), and Buttermilk Cornbread without Flour. Also below are links to two Sweet Milk Cornbreads, one with and one without flour. These basic cornbreads are best served hot and buttered. They make a wonderful accompaniment to vegetable dishes, notably black-eyed peas and beans, as well as chili and stew. Also linked to this page are three recipes for spicy cornbread, Mexican Cornbread, Mexican Creamed Cornbread and Jalapeño Cornbread. Whatever your preference, I think you and your family will enjoy cornbread at your supper table, too, if only occasionally. Not only is it easy and quick to fix, but it's nutritious, as well. One final note: If you have leftover cornbread, wrap it well in aluminum foil and refrigerate it. To reheat, sprinkle a little water on it, rewrap loosely in foil and heat in a 400°F oven for 7 or 8 minutes. This cornbread is best baked in a 10-inch cast iron skillet but if you don't have one, a Pyrex dish will do just fine. If you halve this recipe, use an 8-inch square dish; if not, use a 9x13-inch dish or pan. Put the bacon drippings in your baking dish or skillet and let them melt while the oven is preheating and you're mixing up the batter. Beat the eggs in a medium bowl until frothy. Add the corn meal, salt and baking soda, and stir to thoroughly combine. Add the buttermilk and stir well. Remove the hot pan from the oven. Swirl the pan to make sure it is coated with melted bacon drippings, and pour the bacon drippings into the batter. Stir well to combine. Pour the batter into the pan, and bake 25 to 30 minutes. Cornbread will begin to pull away from the sides of the pan. Preheat oven to 450°F. Sift together the dry ingredients and set aside. Combine beaten egg, buttermilk and vegetable oil. Combine cornmeal mixture with buttermilk mixture, stirring just enough to moisten. Pour into hot, well-greased 9- or 10-inch skillet or pan, muffin tins or corn stick molds. Bake about 15 minutes for muffins or corn sticks, and 20-25 minutes for pan or skillet. Cornbread will begin to pull away from sides. Makes approximately 12 muffins, corn sticks or pieces.